Carlisle will begin offering the Seal of Biliteracy to students. 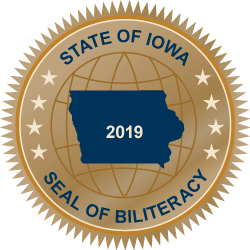 The Seal of Biliteracy is an award given by a district to recognize students who have attained proficiency in two or more languages, one of which is English, by high school graduation. Students will be awarded the Seal based on an ACT score of 18 or above and an AP Spanish test score of 3 or above.